The need for early seasonal forecasts stimulates continuous research in climate teleconnections. 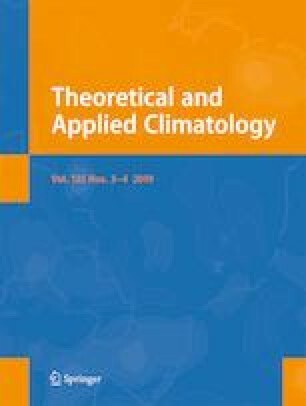 The large variability of the Mediterranean climate presents a greater difficulty in predicting climate anomalies. This article reviews teleconnection indices commonly used for the Mediterranean basin and explores possible extensions of one of them, the Mediterranean Oscillation index (MOi). In particular, the anomalies of the geopotential height field at 500 hPa are analyzed using segmentation of the Mediterranean basin in seven spatial windows: three at eastern and four at western. That is, different versions of an Upper-Level Mediterranean Oscillation index (ULMOi) were calculated, and monthly and annual variability of precipitation and temperature were analyzed for 53 observatories from 1951 to 2015. Best versions were selected according to the Pearson correlation, its related p value, and two measures of standardized error. The combination of the Balearic Sea and Libya/Egypt windows was the best for precipitation and temperature, respectively. The ULMOi showed the highest predictive ability in combination with the Atlantic Multidecadal Oscillation index (AMOi) for the annual temperature throughout the Mediterranean basin. The best model built from the indices presented a final mean error between 15 and 25% in annual precipitation for most of the studied area. Thanks to my tutor Belén Rodríguez Fonseca, from the Complutense University of Madrid. Thanks also to the Climate Research Unit (CRU) of the University of East Anglia and to NOAA for the data provided to conduct this study. Some authors are members of the Climatology Group (2014 SGR 300, Catalan Government) and thanks to the WEMOTOR project (CSO2014-55799-C2-1-R), funded by the Spanish Ministry of Economy, Industry and Competitiveness, generously contributed to this research. Finally we want to highlight the support received from the RESCCUE project, which has received funding from the European Research Council (ERC) under the European Union’s Horizon 2020 research and innovation programme (grant agreement n° 700174). Geographical characteristics for all considered stations are shown in Table 3. For both annual precipitation and temperature anomalies, a fractional order of the 12 versions of the ULMOi (Tables 4 and 5) was estimated following the methodology previously described. JISAO (2017) Joint Institute for the Study of Atmosphere and Ocean http://jisao.washington.edu/data_landing (accessed on 31 July 2017). Mitchell, T. (2016) Sahel precipitation index, Joint Institute for the Study of the Atmosphere and Ocean, Univ. of Washington, doi: https://doi.org/10.6069/H5MW2F2Q. Link: http://research.jisao.washington.edu/data_sets/sahel/ (accessed on 31 July 2017). NOAA (2017) Climate Indices. Enlace: http://www.esrl.noaa.gov/psd/data/ climateindices/list/ (accessed on 31 July 2017). Plumb RA (2003) Atmospheric and Oceanic circulations. Class notes, Massachusetts Institute of Technology (MIT). Link: www.ccpo.odu.edu/~klinck/Reprints/PaperWebPages/plumbAtmDyn03.html. (accessed on 31 July 2017). Spiegel MR, Schiller J, Srinivasan RA (2007) Análisis de la varianza. Probabilidad y Estadística [Schaum's Outline of Theory and Problems of Probability and Statistics]. Schaum (2nd edition). México D.F. : McGraw-Hill. pp. 335–371. ISBN 978-970-10-4231-1. UB (2017) University of Barcelona. http://www.ub.edu/gc/2016/06/08/wemo/ (accessed on 31 July 2017).